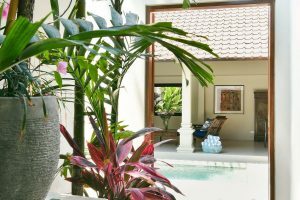 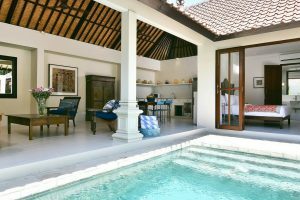 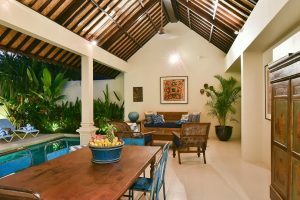 Villa Atma is a beautiful open plan villa with two bedrooms and a stunning landscaped pool all within short distance of the beach, bars and restaurants. 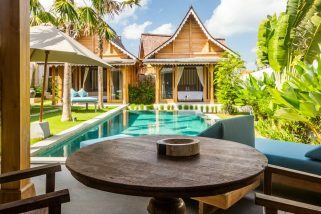 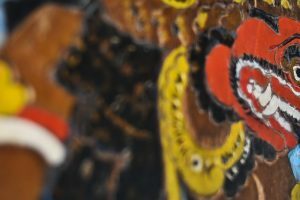 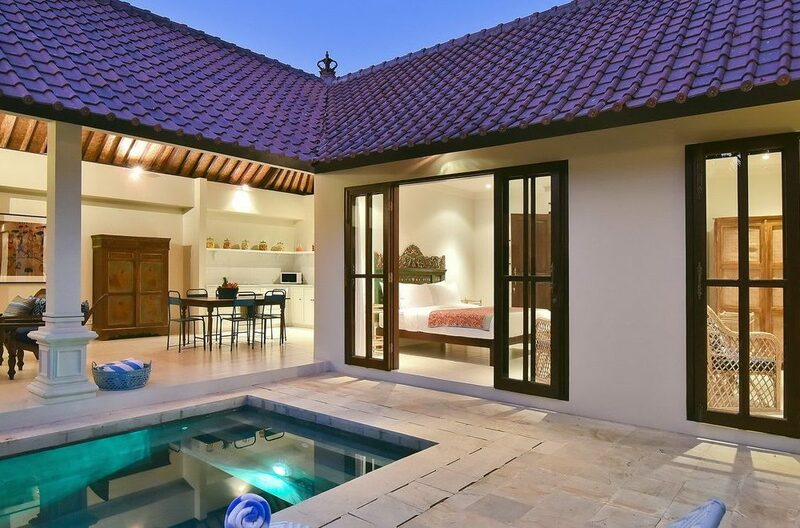 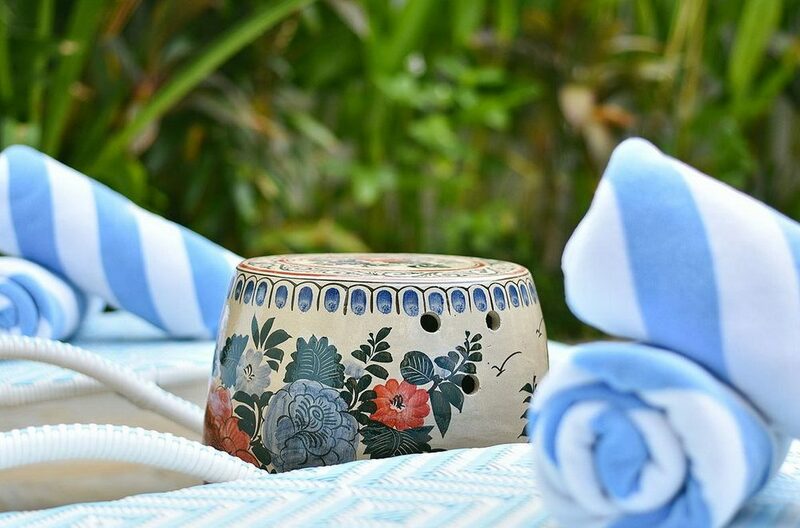 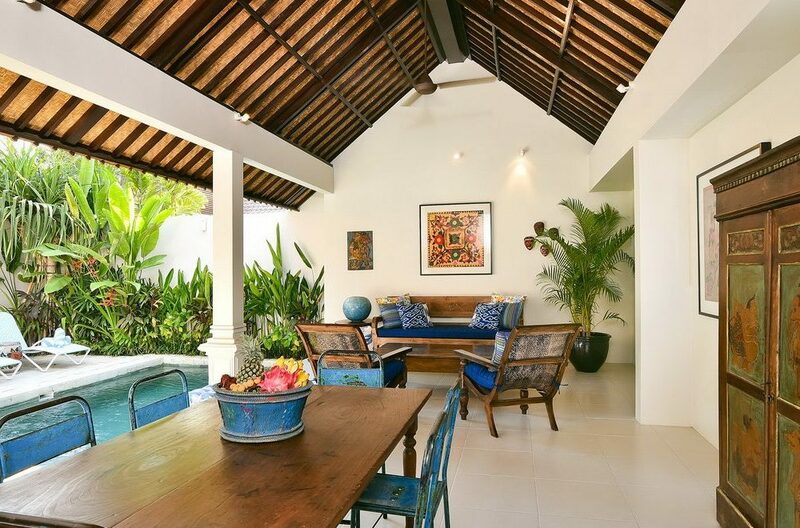 The villa itself offers exquisite interior and exteriors, carefully decorated and filled with beautifully crafted furniture and stunning Balinese art and finishes. 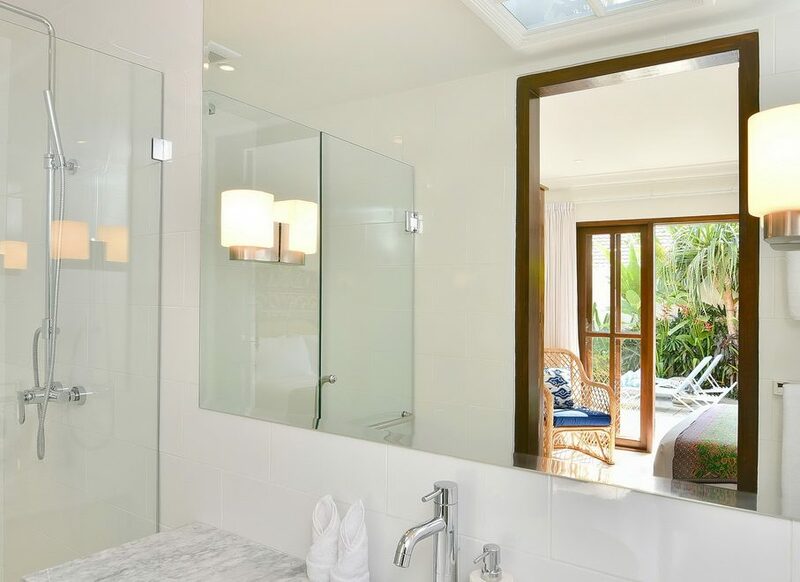 Designed to be as serene and peaceful as can be, you’ll feel your worries and cares drift away the instant you walk through the door. The living area opens onto the landscaped pool and sundeck, providing a private tropical oasis for you to relax, soak up the sun and enjoy your days. 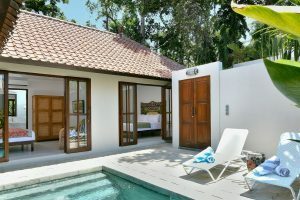 Here you can lie back in designer sun loungers, go for a dip or take in the views of your tropical surroundings. 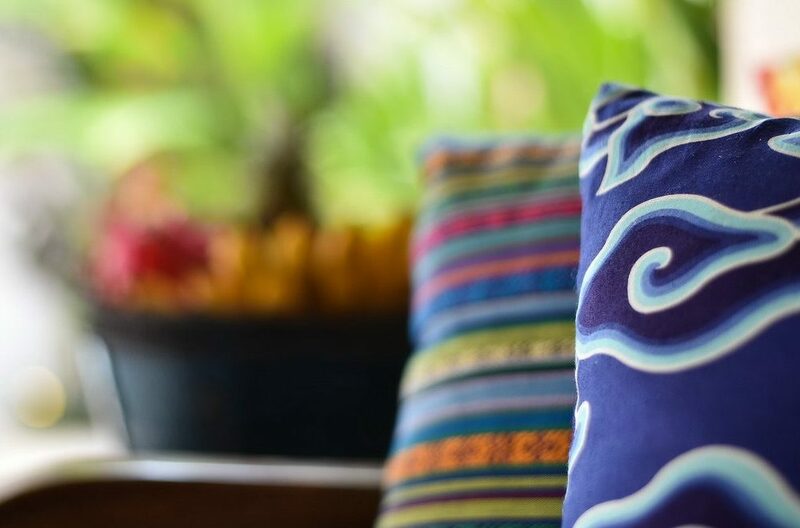 The living space is equipped with plenty of colourful pillows for you to sink into, and a high quality music station to further set the mood. 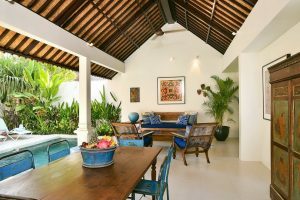 The spacious dining room also features views of the pool and garden, and contains a striking wooden dining table that comfortably seats six. 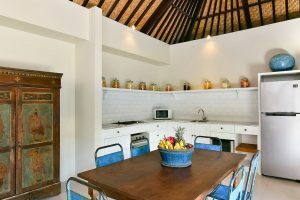 The adjoining kitchen boasts a double fridge and separate wine fridge, a large stove and French press coffee maker as well as every appliance you could need including a microwave, blender and toaster. 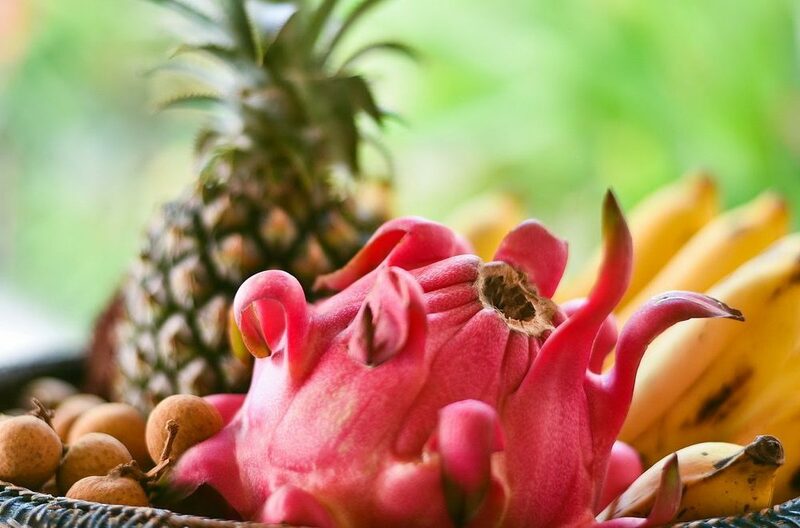 When you first arrive, you’ll find fresh fruit and tropical welcome drinks waiting for you – starting your holiday in true Balinese style. 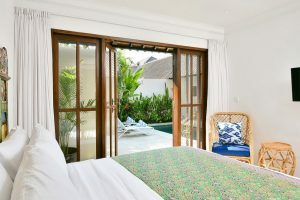 The two bedrooms are spacious and immaculately furnished. 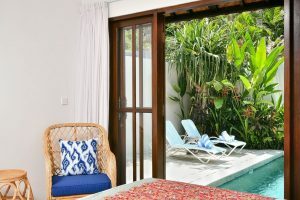 The first has a super king or two twin beds and the second a super king so comfortable you’ll have the best night’s sleep you’ve ever had. 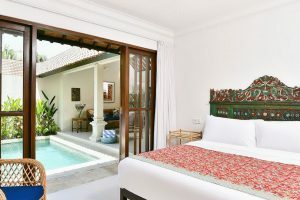 Both bedrooms open onto the pool and terrace, and feature unique headboards made from antique woodcarvings. 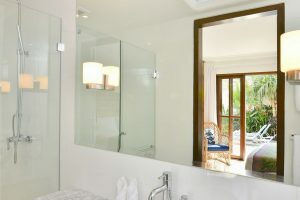 Each room is light and airy, complete with air conditioning and a large TV so you can enjoy some downtime or catch up on your favourite shows. 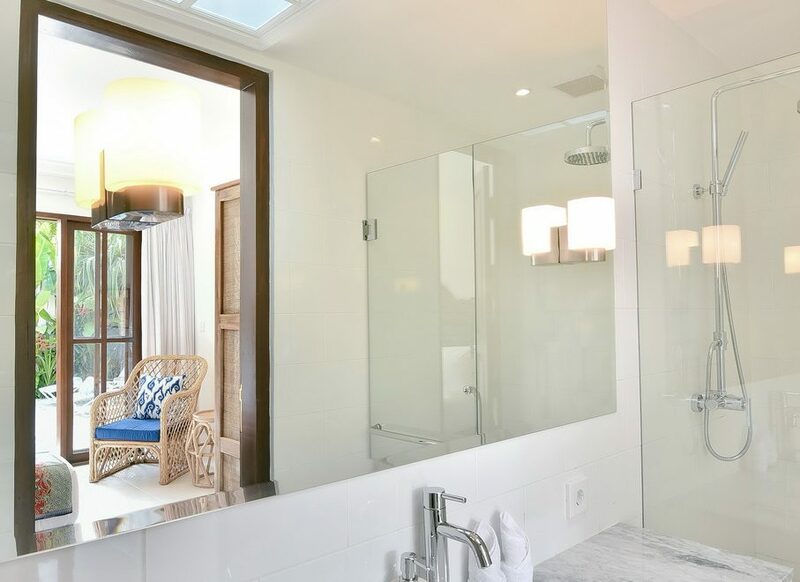 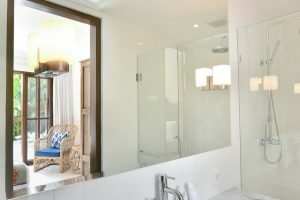 The villa also offers two spacious bathrooms with luxurious rain shower heads and hand showers, as well as a guest toilet by the kitchen and living area. With everything you need for a relaxing holiday and filled with Balinese soul, Villa Atma is a home away from home and the perfect place to unwind with your family and friends. 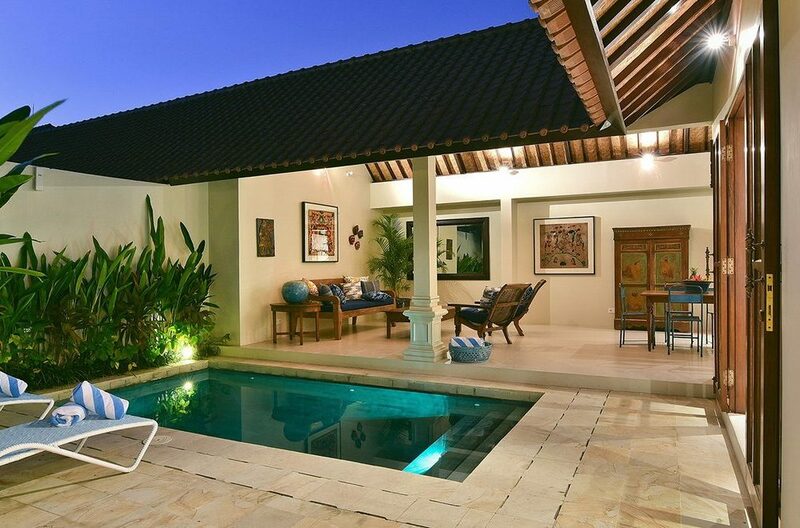 To view more Seminyak villas or other Bali villas please use this website or contact our reservation team. 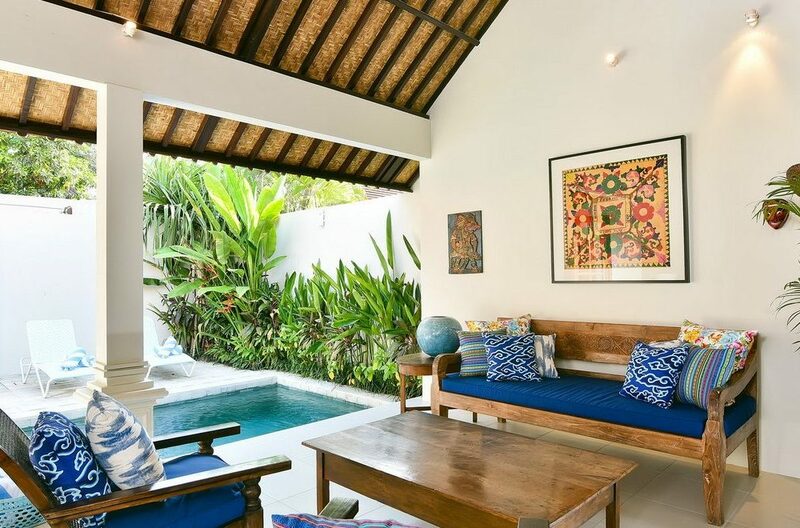 Nestled in the rice paddies of Kerobokan on the edge of Seminyak, Villa Du Bah is a traditional yet elegant three-bedroom getaway. 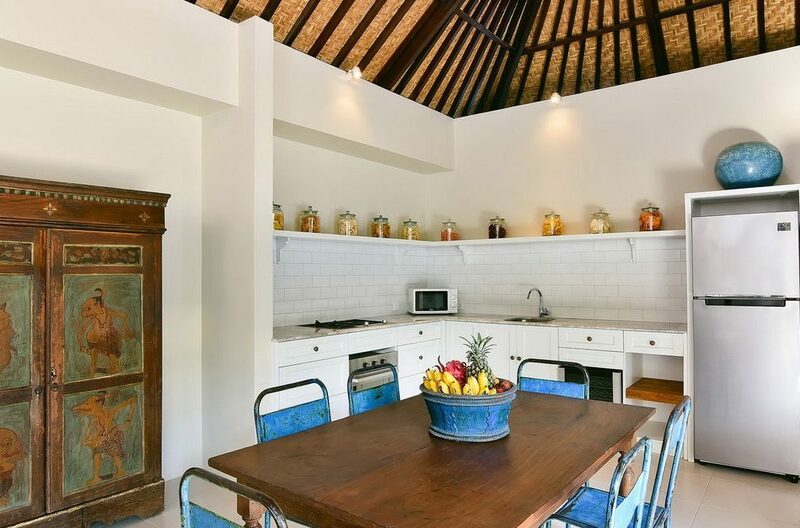 The unique Javanese style has been recreated in this top Bali location and complemented with a sleek design, whitewashed furniture, pale timber and a modern, luxurious interior. At Villa Taramille, contemporary and traditional Balinese influences merge into a luxurious three-pavilion complex that will be the setting for your best vacation yet. 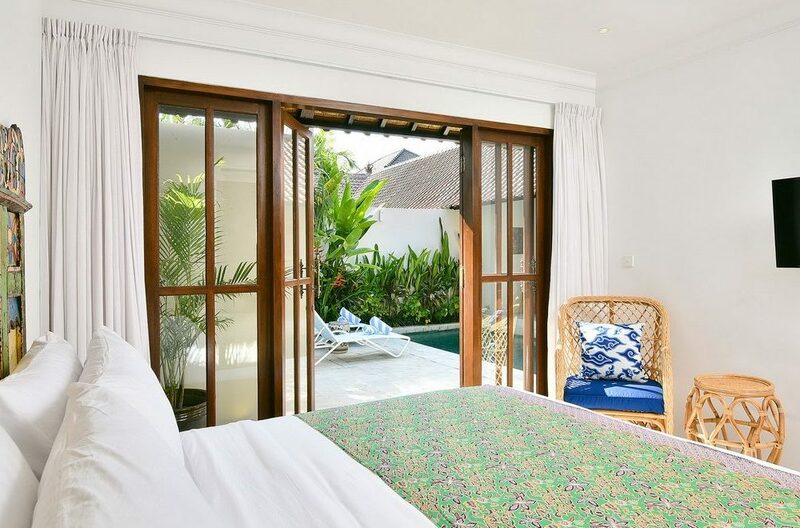 The glassy, refreshing waters of the twelve-meter pool are surrounded by plush bedrooms. 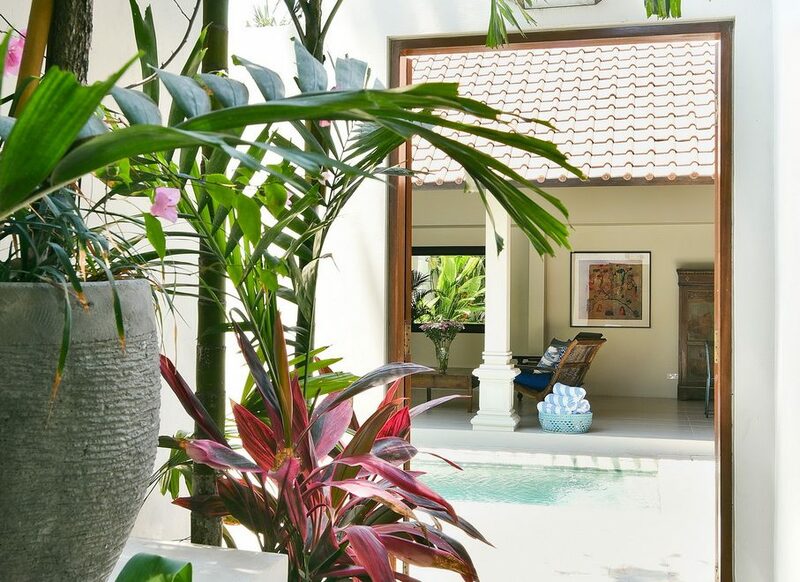 Situated within the safe confines of Seminyak’s Laksmana estate, an exclusive enclave of luxury private villas just minutes from the beach, Villa Jemma awaits you.